For those interested, I’ve done a tabulation of Census Bureau state and local government finances data for FY 2014 (the latest available) compared with FY 2004, and am writing a series of posts. The most recent was on infrastructure, here. The general trend is spending on pension contributions are up, and spending on just about everything else is down, when measured per $1,000 of personal income. here, but that seems to be part of the overall shift from those working to those retired. Taxes are high here and up too, but fell in low-tax states, part of a divergence that doesn’t make sense to me. fall, further exposing the need for additional pension contributions. As for those bioswales, they were a Bloomberg initiative to reduce the extent to which the EPA forced the city to build huge underground storage tanks to store stormwater runoff until it could be treated. I guess Avella wants higher water and sewer rates and more tanks. Avella is a member of the state legislature. Which means he voted to for the most recent retroactive pension deals that are draining education, and the huge debts that are draining the MTA. I don’t vote for NY state legislators for anything, including the state legislature. Funny to read the Voice article and see quotes from Angotti and Shiffman objecting to the local veto, for those who knew them back in the day. Perhaps power to the political establishment is not the same thing as “power to the people” after all. We only need the bioswales because DOB and others turned a blind eye towards overdevelopment in parts of Queens. Many people paved over their yards to create parking and didn’t bother to consider using building materials that would have absorbed stormwater runoff. As a result, flooding increased and the City is forced to spend money on bioswales. This is what happens when we don’t prioritize green space. Tom Murphy said this to a reporter… who was covering a public meeting… where DOT was presenting a proposal… to seek out community approval… before moving forward with a set of bike lanes. It sounds as if they hate being cut out of the loop. These dinosaurs are so used to lording over their petty fiefdoms, that when the tides change they develop all sorts of wacko paranoia. Within a election cycle they’ll be just grumpy old guys stuck in motor traffic yelling at pretty young things blissfully cycling past them on PBLs. Maybe. But just remember that in the suburbs all of the stormwater runoff is going directly into the waterways. There is no discussion of treating that. And you still have cesspools in some places. So water quality is still problem around Long Island despite all the reduction in combined sewer overflows from NYC. I have to say that effortless assist to 20 MPH is too fast for existing bike infrastructure. Most people aren’t capable of sustaining these speeds on their own, but imagine if everyone on the greenway or in a PBL was doing these speeds. Limiting assist to 15 MPH would not affect travel time much but would dramatically improve safety and reduce stress on dedicated bike infrastructure. I wouldn’t assume that people are doing top speed at all times. You usually only see them do it on long stretches of green light with no bike infra (ie the same time that people on pedal bikes break 15mph). Most of the time they’re only outrunning people on regular bikes going uphill. “..I have to say that effortless assist to 100 MPH is too fast for existing MOTOR VEHICLE infrastructure. Most people aren’t capable of sustaining these speeds SAFELY , but imagine if everyone on the ROADWAY was doing these speeds. The fact that slowing car speeds to improve traffic safety is roundly ignored or opposed, doesn’t invalidate crazytrainmatt’s point that “effortless assist to 20 MPH is too fast for existing bike infrastructure.” I think he’s absolutely right. I agree. If you are moving as fast as a motor vehicle, move into the motor vehicle lane. when 200 watt ebikes injure 125 New Yorkers each day, then we can expend energy on reducing this nuisance. Until then, all efforts should be on reducing 200,000 watt driver violence which puts 125 New Yorkers in the hospital each and every day. you mean the gallon a month of RoundUp my brother-in-law sprays on his lawn in Rye doesn’t stay in the ground ? Except for the fact that 20 mph isn’t enough to keep up with motor vehicles. If we really don’t want e-bikes to use bike infrastructure then let’s make the legal definition of an e-bike include any motorized bike with a top speed of about 40 mph or less. 40 mph lets you keep up with motor traffic in NYC under nearly all situations. Doesn’t the same problem exist when fast cyclists pass slower ones? Motor vehicles regularly deal with speed differences of 10 or 15 mph between individual drivers. I don’t see why it’s so hard to have 20 mph e-bikes among cyclists whose speeds might vary between 10 mph and 20 mph. At best we’re talking a 10 mph speed difference, assuming the e-bike rider doesn’t slow down. In many cases e-bike riders will in fact reduce speeds to less than maximum in heavy bike traffic. The truth is having the huge lawns many suburbanites have is in itself a major problem. Any time you’re trying to grow non-native plants you often end up needing to use huge amounts of chemicals. Maybe we should insist on native plants instead of grass. Grass is boring anyway. Better to maybe grow vegetables on that space. You’re less likely to use chemicals on stuff you eat. It also greatly reduces greenhouse gases when you grow some of your own food. the hundreds of billions we spend every year subsidizing mass motoring produces all sorts of untended negatives – excessively large lawns is one example. I agree with everything, especially the traffic signals from hell. The rare times I ride during day hours in places with lots of traffic signals, it’s tedious and annoying to the extreme, which is why I rarely do it in the first place. Yes to PBLs along every limited access highway in the city. And yes to mainstreaming velomobiles. I’d like nothing more than a nice, steady cruise at 50 or 60 kph in a velomobile in such PBLs. Great on every level. When people see how fast and great active transportation is when given the right infrastructure/vehicles, many will voluntarily give up their hulking death machines, as you like to call them. 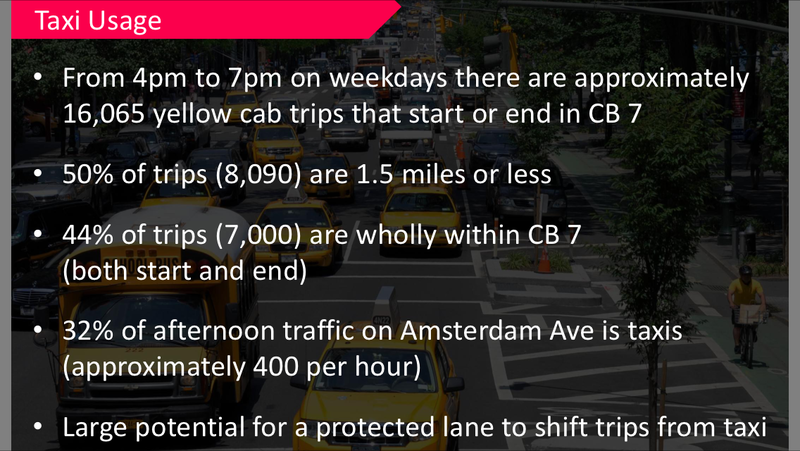 Here is a fascinating slide from a NYCDOT presentation a few years ago on UWS. approx. 15% of motor traffic (1/2 of 1/3) on UWS during afternoon rush hour consists of taxi trips of 30 blocks or less. that’s a extremely compelling argument for creating a true network of PBLs. another data point: In London 22% of cyclist trips would have been otherwise done by motor vehicle ! That’s a yuge percentage, especially given the paltry PBL network in London. Now if one would return PBLs to NYC parkways….on can imagine a sea change in mobility patterns.